Fortinet discovered a strain of ransomware dubbed Spritecoin ransomware that only allows victims Monero payments and pretends to be a cryptocurrency-related password store. Researchers from Fortinet FortiGuard Labs has discovered a strain of ransomware that only allows victims Monero payments and pretends to be a cryptocurrency-related password store. The ransomware poses itself as a “spritecoin” wallet, it asks users to create their desired password, but instead of downloading the block-chain it encrypts the victim’s data files. The malware includes an embedded SQLite engine, a circumstance that leads experts to believe it also implements a credentials harvesting feature for Chrome and Firefox credential store. The malicious code appends the .encrypted file extension to encrypted files (i.e. resume.doc.encrypted). While decrypting the files, the Spritecoin ransomware also deploys another piece of malware that is able to harvest certificates, parse images, and control the web camera. 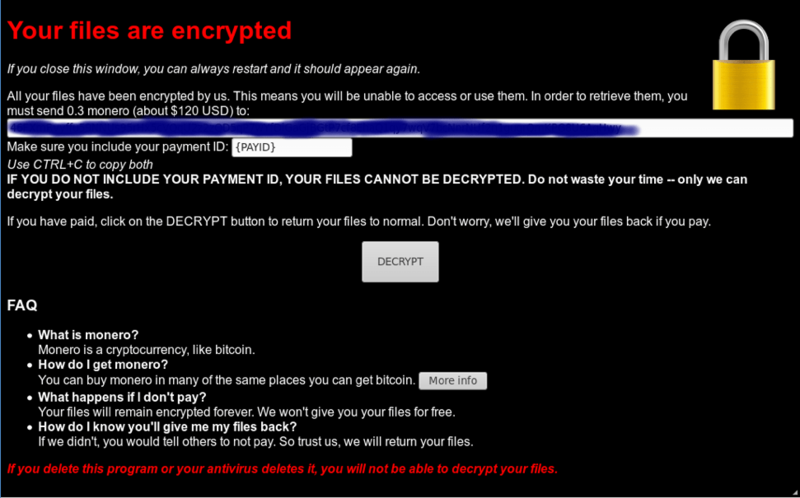 “In a cruel twist, if the victim decides to pay and obtain a decryption key they are then delivered a new malicious executable [80685e4eb850f8c5387d1682b618927105673fe3a2692b5c1ca9c66fb62b386b], detected as W32/Generic!tr.” reads the report. The experts speculate the ransomware is being spread via forum spam that targets users interested in cryptocurrency. When the victims provide their credentials the Spritecoin ransomware inform users it is downloading the blockchain, while it is actually encrypting the files. The ransomware connects to a TOR site via an Onion proxy (http://jmqapf3nflatei35[. ]onion.link/*) that allows the victim to communicate with the attacker’s website without the need for a TOR connection. Further details, including IoCs are included in the report.